Montreal’s eStruxture Data Centers has raised or secured $260 million in capital in recent months and forged relationships with several major investors as it moves to position itself as a key player in the emerging sector. Most recently, eStruxture secured $180 million in committed capital in mid-January with the addition of Fengate Real Asset Investments as a co-lead investor and a new, expanded debt financing facility with Scotiabank, National Bank of Canada and Investissement Québec. eStruxture offers co-location, private cloud, managed services, bandwidth, security and support to its more than 850 users, which include carriers, cloud providers, media, content, financial services and enterprise customers. In June, the company vaulted on to the scene by raising $80 million in capital and acquiring the assets of Netelligent Hosting Services, one of the largest data centre operators in Montreal. The raise was led by real estate development, investment and management company Canderel and institutional investor Caisse de depot et placement du Québec. That initial acquisition, a downtown Montreal data centre known as MTL1, is being expanded to add another three megawatts of capacity while almost doubling the available space. Additional redundant infrastructure components for cooling and electrical distribution are also being added. The expansion will support growth for both new and existing customers and eStruxture’s high-density power configurations of up to 30 kilowatts per cabinet. Coleman said each cabinet has as much power as a house, but takes up no more than 25 square feet. MTL1 will be ready to launch at the beginning of the second quarter, according to Coleman. The network and cloud-neutral data centre operator’s second purchase was the Montreal Gazette‘s former printing facility, which eStruxture is transforming into the 30-megawatt capacity MTL2 data centre, which will have equivalent power to a city of 25,000 homes. The 156,000-square-foot building, acquired in December, was left vacant since the Gazette closed it in 2014. Upgrading and expansion work has begun, and MTL2 is expected to open in the spring. The $150-million investment will include a redundant fiber loop connecting the site to eStruxture’s existing downtown data centre. “We have larger customers that are very interested in putting major deployments into that building as well as other customers — both existing and new — that like the ability to have certain of their applications in our downtown facility,” said Coleman. Montreal is a prime market for data centres, as it offers: access to clean and affordable energy; a cool climate that limits the amount of energy needed for cooling; a flourishing digital ecosystem; and a strong technology sector with many potential clients. “Montreal’s adjacency to the U.S. is important to a number of customers who want to be close to the U.S. border but, for Patriot Act reasons or other political reasons, might want to stay on the Canadian side of the border,” said Coleman. Coleman said data centres should be attractive to investors because they provide a long-term monthly recurring revenue stream. “Customers move into a mission-critical environment and sign long-term contracts of typically three to five years or greater. They commit to a certain amount of power and capacity that has a certain revenue volume to it. That’s very attractive for investors. eStruxture plans to use its new funds for facility and geographic expansion to expand its data centre footprint across the country. “More and more customers are coming to us, and their demand is immediate,” said Coleman. “They don’t have the ability to wait for six or 12 months for you to build out more space. Competition is heating up in the Canadian data centre market. San Francisco-based Digital Realty Trust, Inc. acquired data centre real estate investment trust DuPont Fabros Technology in an all-stock transaction valued at approximately US$7.6 billion in September. Digital Realty, which has a market cap of US$22.8 billion, now owns a data centre in Markham and will open another one, TOR1, in the former Toronto Star printing facility in Vaughan this spring. 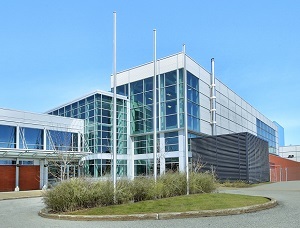 GI Partners, a private investment firm based in San Francisco, acquired a new 215,000-square-foot data centre in the Montreal suburb of Vaudreuil-Dorion from Ericsson in January. Summit Industrial Income REIT (SMU-UN-T) ended 2017 by entering a joint venture partnership with Urbacon to develop, own and operate digital data centres across Canada. Summit launched the partnership with the purchase of a 50 per cent stake in Data Centre One in the Barker Business Park Digital Campus in Richmond Hill, Ont. Chief executive officer Paul Dykeman told Real Estate News Exchange earlier this year that Summit could eventually grow its portfolio to the size where it could be spun off into a separate REIT. Potential competition doesn’t seem to concern Coleman, however, who said eStruxture plans to be a consolidator in the sector.